Situated along the ceremonial Rajpath avenue in New Delhi, India Gate, popular Delhi attraction is a memorial raised in honour of the Indian soldiers who died during the Afghan wars and World War I. The names of the soldiers who died in these wars are inscribed on the walls. It is the ceremonial boulevard of the Indian republic that boasts of ornamental parks, pools and gardens alongside. It is here that the much-awaited event of Republic Day Parade takes place on 26th January every year. Rajpath runs through India Gate and Vijay Chowk and has Rashtrapati Bhavan at one end and National Stadium at another. The green lawns at India Gate are a popular evening and holiday rendezvous for young and old alike. Rashtrapati Bhawan of Delhi is considered to be the best known monument of India next to glorious Taj Mahal and Qutub Minar. Built with a mix of Western and Indian styles, Rashtrapati Bhavan was originally built for the Governor General of India. Inaugurated in 1931 as the Viceregal Lodge, the name was changed in 1950 after India became a republic. Also calle d Laxminarayan Temple, the Birla Mandir was built by the Birla family in 1938. Along with the temple itself, the name 'Laxminarayan Temple' encompasses a large garden with fountains behind it. The temple attracts thousands of devotees on Janmashtami day, the birthday of Lord Krishna and is popular Tourist attraction in Delhi. The Aksha rdham Mandir is situated in The Akshardham Temple Complex in East Delhi one of the major Delhi attraction. The Akshardham temple is spread in the area of nearly 100 acres on the banks of river Yamuna. Akshardham Temple it is the largest Hindu temple in the world. The complex boasts off an IMAX theatre, a food court, a gallery and an open-air theatre. Qutub Minar at Delhi is a 5 storied tower. Each tower of the famous Qutub Minar has unique designs. 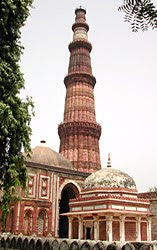 The Qutub Minar is located in a Mehrauli in South Delhi. The world famous towering Qutub Minar, started in 1192 by Qutub-ud-din Aibak. The Qutub Complex is a fine example of the Indo-Islamic style of architecture. The balconies in the tower are supported by exquisite stalactite designs. The tapering tower has pointed and circular flutings on the first storey and star-shaped ones on the second and third stories. The Qutub Minar is also significant for what it represents in the history of Indian culture and is one of the main Delhi tourist attractions. Red Fort another popular Delhi attractions also known as Lal Quila.The Mughal emperor, Shah Jahan, after ruling from Agra for eleven years, decided to shift to Delhi and laid the foundation stone of the Red Fort in 1618. It took nine years to build this mighty citadel and it got completed on 16th April 1648. The Red Fort Delhi has two main entrances, the Delhi Gate and the Lahori Gate. The main entrance to the Red Fort is through the Lahori Gate. Beyond the gate, there is a roofed passage, flanked by arcaded apartments leading to the palaces, known as Chhatta Chowk. Even today, the Red Fort is an eloquent reminder of the glory of the Mughal Empire. Chandni Chowk, a main marketplace in Delhi, keeps alive the city's living legacy of Shahjahanabad and is popular Delhi attraction. It is also one of the Delhi famous places. Created by Shah Jahan the builder of Taj Mahal, the old city, with the Red Fort as its focal point and Jama Masjid as the praying centre, has a fascinating market called Chandni Chowk. Legend has it that Shah Jahan planned Chandni Chowk so that his daughter could shop for all that she wanted. The market was divided by canals. The canals are now closed, but Chandni Chowk remains Asia's largest wholesale market. Across the street from the Red Fort lies Chandni Chowk, an area completely dedicated to shopping, trading and eating. While the Red Fort offers tranquillity, Chandni Chowk is its opposite. It is an enormous area, packed with all sorts of shops, bazaars, people of all kinds. Popul arly known as the Lotus Temple, Baha'i Temple is a major feature of Delhi and is well known for its appearance and is one of the main Delhi attractions. Lotus Temple is one of the remarkable architectures of Bahai faith. It is located at Kalkaji in New Delhi. The temple looks like a lotus flower and is made of marble, cement, dolomite and sand. The temple has no restrictions for visitors and is open to people from all religions. The design looks like a half opened Lotus flower with 27 freestanding "petals" made of marble. The architect, while designing the temple took into account the eternal beauty of Lotus flower. The Old Fort (Puran a Qila), another Delhi attraction is a good example of medieval military architecture. Built by Humayun, with later-day modifications by Sher Shah Suri, the Purana Qila is a monument of bold design, which is strong, straightforward, and every inch a fortress.The current entrance is a grandiose red sandstone gate on the western wall. This is called as Bara Darwaza or the main gate. It has a double-storeyed façade that has chhatris (elevated dome shaped pavilions) and a steep ramp. The Qal'a-I-Kunha Masjid and the Sher are two important monuments inside the fort. It was made by Aqeel in 1853. The famous Hum ayun's Tomb of Delhi represents the first of the many monumental Mughal architectural structures. The Humayun's Tomb is one of the fulgurous landmark in the evolution of regal architecture of the Mughal in India. Humayun's Tomb was built by Humayun's widow, Hamida Banu Begum. Designed by a Persian architect named Mirak Mirza Ghiyas, the structure was begun in 1562 and completed in 1565. The tomb established a standard for all later Mughal monuments, which followed its design, most notably the Taj Mahal. The tomb stands majestically at the center of the enclosure and rises from a platform faced with a series of cells with arched openings. The surrounding of Humayun's Tomb of Delhi is dotted with fountains. During the tourists season you will find the place is crowded with tourists and the street vendors are busy selling various food items to the cheerful public. The ISKCON Temple is another popular Delhi tourist attractions and is located at Sant Nagar, near the East of Kailash locality. It is one of the 40 temples in India that belongs to the International Society for Krishna Consciousness, dedicated to Lord Krishna. One of the many Gurdwaras in Delhi, Gurdwara Bangla Sahib is the most visited one in the Delhi area. Salimgarh Fort, which is now part of Red Fort complex, was constructed on an island of the Yamuna River in 1546. But a gate called the Bahadur Shahi Gate for entry into the Fort from the northern side was constructed only in 1854-55 AD by Bahadur Shah Zafar, the last Mogul ruler of India. The gate was built in brick masonry with moderate use of red sandstone. On the bank Yamuna River, which flows past Delhi, there is Raj Ghat, the final resting place of Mahatma Gandhi, the father of the nation. The Jantar Mantar consists of 13 architectural astronomy instruments, built by Maharaja Jai Singh II between 1727 to 1734. The Safdarjung's Tomb is a garden tomb in a marble mausoleum. The National Museum, New Delhi is the largest museum in India. It holds variety of articles ranging from pre-historic era to modern works of art. Apart from mentioned Delhi Tourist Attractions you can also visit and enjoy, some amusement parks like Fun 'N' Food Village, Adventure Island, Delhi haat etc. Shopping in Delhi is very easy and a fun loving exercise and another Delhi attraction. As the city has heavy number of choices in the city for shopping. There is sarojini market, Chandi Chowk, Lajpat Nagar, Paharganj market, Janpat Market, Daryaganj market are some of the most popular shopping joints of Delhi. Good post on Delhi Tourist Attractions. Keep it up. Coming to Delhi for a week tour. I shall surely love to see this top Delhi tourist attractions.This post is very helpful on gathering information on attractions of Delhi. Very informative post. This blog on top 10 Delhi tourist attractions, will be helpful to many who is planning to visit New Delhi, India. Perfect. This post gives the ideas about top tourist attractions in Delhi. During Delhi tour, you should not miss the top places to visit in Delhi. There are historical sites like Red Fort, Humayun's Tomb, Qutub Minar Complex and Purana Quila. India Gate, Kamani Auditorium, Rashtrapati Bhavan etc. There are number of religious sites like Akshardham Temple, Chattarpur Temple, Iskcon Temple, Lotus Temple and many more. *Select City Walk Mall - favorite destination for shopping lovers in Delhi. Thanks Raj, for informing about more attractions of Delhi. Truly the best info to know about best of Delhi tourist attractions.